Edison was probably the greatest inventor the World has ever seen. He gave us the technological beginnings of the modern World . The ideas and creations of this tireless inventor brought us out of the steam age and into the twenty first Century. Thomas Alva Edison was born on 11th February 1847 as the seventh baby of his parents. He was born so weak that his parents feared he would die. Alva survived but remained deaf right from childhood. He could hear only silence. At the age of eight Alva went to school. He sank to the bottom of the class and left the school at the age of fourteen. His mother played an important role in helping Alva’s abilities to emerge. She built up his confidence to learn by himself. With father’s help, Alva became a Newspaper boy on the train. He used to sell newspapers in addition to peanut, popcorn, candy etc . Alva was happy he was making his own money. He spent his spare time in the library, reading for hours. He installed his laboratory in an empty luggage van. At the age of sixteen Alva became a Telegraph operator for the newspaper. He continued his experiment in telegraphy. He was sacked from service several times. In spite of that, in 1870, he produced a multiplex system that allowed several messages to travel over a wire at the same time. Edison married Mary, in 1871. She worshipped her gifted husband. Edison loved Mary for her beauty, sweetness and total dedication. They had three children. 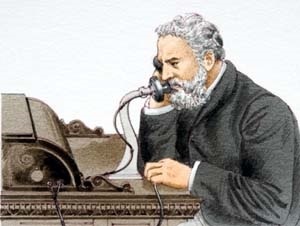 In the mean time in 1876 , Alexander Graham Bell invented Telephone. Edison improved it by revalorizing its method of transmitting an electrical signal. Edison worked tirelessly and invented the phonograph in December 1877. The British, who had always ridiculed him as a mere technician, hailed him as a discoverer. American President wanted to hear this new invention at the White House. After Gramophone electric bulb was the most important invention of Edison. Before achieving his great breakthrough with electric lighting, he constructed no less than three thousand separate theories to cover its working. By relentlessly experimenting, he whittled the three thousand down to two. After establishing that carbon filament worked, he then carbonized six thousand different types of material to decide which one worked best. In the modern light bulb Tungsten filament heats up when an electric current passes through of it. This makes a wire glow. Edison thought of using Tungsten himself but the technology did not exist to let him carry out this experiment. . In 1887 Alexander Graham Bell also produced Phonograph of his own but he recognized the contribution of Edison. Bell wanted Edison to market it jointly. However, Edison wanted to go alone. He resurrected the forgotten machine he had built 10 years earlier. After one year of efforts Edison’s machine worked better and made a lot of money. Once the machine had been put on the market public preferred it as an avenue for providing entertainment. In 1888 some British photographer discussed with Edison the Phonograph records to go with photographs. 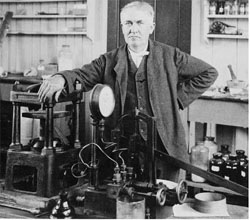 Edison invented “Kinetos Copes” by combining both. In 1889 Edison worked further on moving pictures. In 1894 a Frenchman Lumiere bought an Edison Kinetos Cope, adapted to take a projector and in 1895, opened the first public cinema. For Edison invention was as natural as breathing. He invented even in dreams. Edison was the grand old man of science and took out 1093 patents on his work. On the evening of October 21, 1931, a great shadow swept across the country of USA, like an eclipse, Edison had died at the age of eighty four. Even the statue of Liberty briefly held a darkened torch aloft. Edison had brought light and sound to every house.